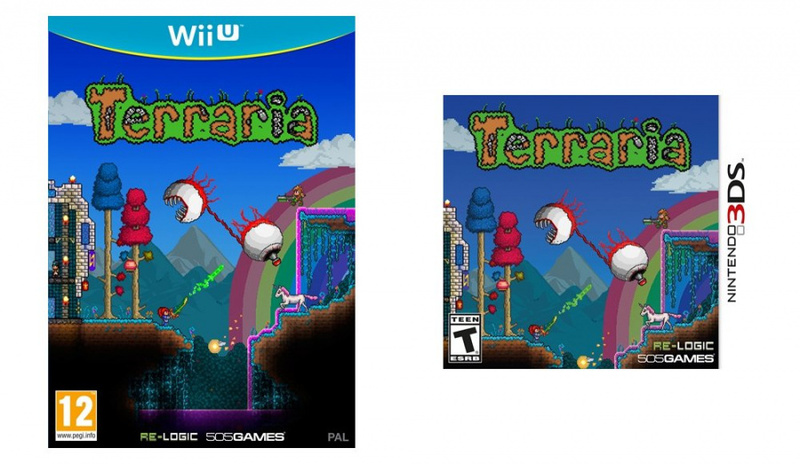 We all knew it was going to happen, but it has finally been confirmed - Terraria is coming to Nintendo platforms. Re-Logic's 2D platforming sandbox title will be getting a retail release on both the 3DS and Wii U, with both versions offering touch-screen support which should make the Minecraft-style world creation a bit easier. The handheld edition has four-player local play, while the Wii U version will allow four players to use the same screen (with some naturally using Wii Remotes). The home version also boasts an eight player online mode, too. The bad news is that the publisher doesn't anticipate a release until "early 2016", which feels like an awful long time away to us. Hmmm I hope it features the latest console version. I suppose the 3ds version might be the one to go, as you have a stylus and seems more comfortable than a wii u game pad. But it seems not online multiplayer? Why? But yeah, I wonder why the long wait. And I presume thats not the final boxart? @Gridatttack I suppose an advantage of the Wii U edition would be that with the multiplayer, you wouldn't have to get your friends to buy multiple copies of the game, and the Wiimotes would be pretty useful for the cursor and stuff. This should prove interesting, I wonder if they can pull off a 3DS version with such a limited resolution? The game originally launched for 640x480 resolution at a minimum, these days there are boss sprites that wouldn't fit on even that size of a screen. Also, I hope it's fairly cheap (£20 or less) as I've already paid for this game multiple times now... and keep in mind, it's about £7 for the definitive PC version. Given how long it's been on other platforms I wonder how it'll perform.so 2016 has this,FExSMT and zelda , between that and the dragon quest nx announcements im rather confused. I was hoping it released this year. Not a big deal seeing that I will have plenty of games to play for the rest of 2015. Sweet! Been kinda edging around this game, as I usually like playing things on the 3DS anyway. Guess I'll have a chance to finally download it. Im also a bit curious how they pull it off on the 3DS. The limited Resolution could be a bit iffy. From what I have been hearing from my friends playing it on Sony hardware, it will be worth the wait. What's with 505 Games releasing games on Nintendo's consoles without any online support whatsoever?! The Nintendo 3DS version's online multiplayer should be integral to the experience. I am suspicious of the fact there is no Nintendo Network logo on that Wii U cover. In addition, will there be a cross-save support for both versions? The box art looks terrible, like a random screenshot with the game's logo slapped on.
" The home version also boasts an eight player online mode, too." @ikki5 Like I just said, I am suspicious of the fact that the Wii U cover is lacking a Nintendo Network logo, despite that statement. @DekersHekers The 3DS and Wii U versions are retail-only, I think. @HopeNForever Who's saying that it's the final box-art, though? Early 2016 is a long way away, but on the bright side they announced it for Wii U and not NX. Does Zelda U have a time frame yet, their financial report simply said TBD, it doesn't even have a year. It's 3rd party, couch co-op, online. We'll probably pick it up if they price it right. Not even sure why it's retail and not DL, seems like a DL title to me. I enjoyed the demo on PS3 way back when but never bought it. Why is the 3DS box art rated T for teen but the Wii U Pegi 12? That box art looks like it was made through Microsoft Paint. Awful job. Just got the physical version for Vita, so I'll probably pass on this version. I see no reason to release this on the Wiiu. Yessssssss!!!! Gonna download it on the eShop as soon as it's out! @rjejr one box is us one isn't. 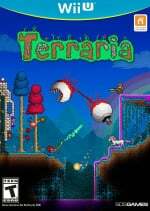 I've played enough Terraria for 3 life times. Really? That long? Well, I'll probably still check it out. I mean, I've heard it's good, so...yeah. Why not? Gah, just put it on the eShop the second that it's finished. Do you really need a box for this game? And there are screenshots floating around. The 3DS version looks... pretty rough. I have this on PS3 and PS4...not that bad of a game, but the controls get confusing after a short time into it, so the Wii U version I may purchase just to use the stylus and touch screens. Other than that, I hope it's $20 or less, or they're waiting for a flop on nintendo systems. @Mus1cLov3r Meh. Still good to get, even if in digital form. @JLPick It'll definitely be $20+ for the Australian price. That's just how much games cost over here. Well, if I didn't get it for free from Games with Gold I'd be all over this version. It looks like a ton of fun. @TwilightAngel Why is that. More third-party support the better. I know I'll be getting it on Wii U. The touch screen and button combo will be great. @RupeeClock I don't see why not. It is pixel art. Why are people moaning about the box art? It's probably a placeholder knocked together by someone at Nintendolife or pulled from another site. You have absolutely no grasp of display resolutions or processing power then.